RASC Vancouver’s Scott McGillivray talks about the first image of a black hole and the Israeli Moon lander. 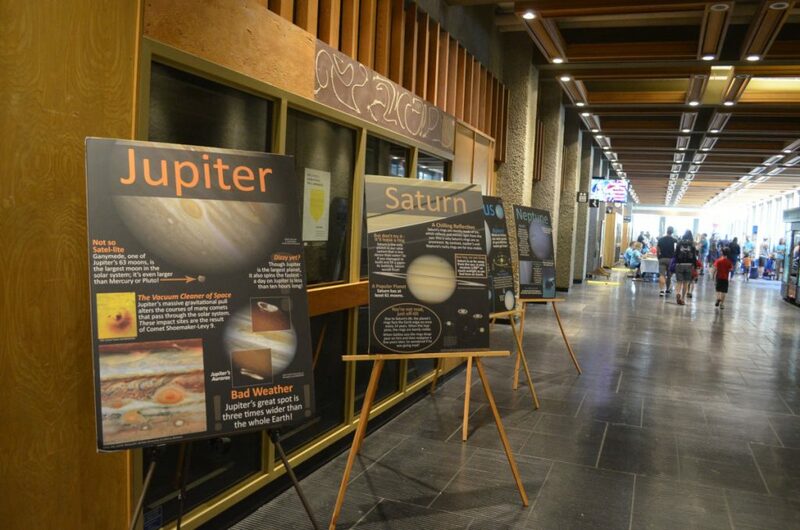 Join us on May 11th at Simon Fraser University’s Science Rendezvous and International Astronomy Day 2019. Science Rendezvous is the largest science festival in Canada that seeks to engage the public (and especially kids!) 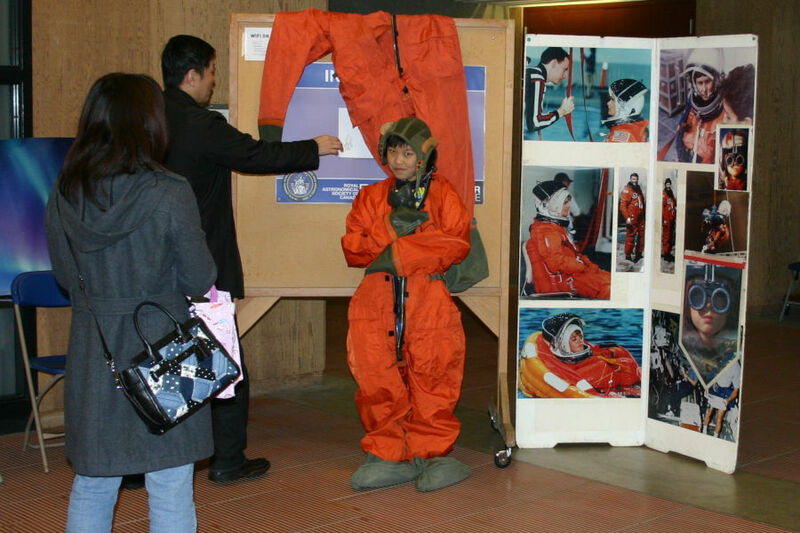 through interactive science activities, demonstrations, and laboratory experiences. 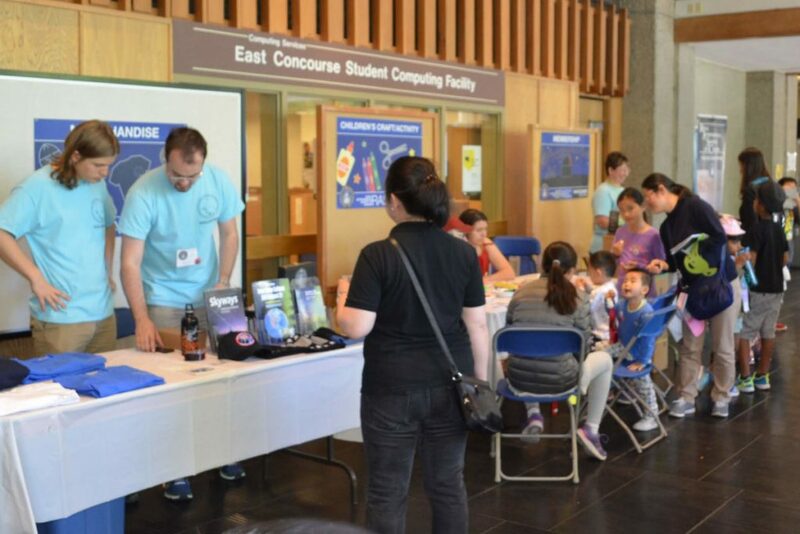 Participants can explore dozens of hands-on science activities and demonstrations that will delight all ages at the South and East hallways of the Academic Quadrangle at SFU’s Burnaby campus, Saturday, May 11th from 11 am – 3 pm. 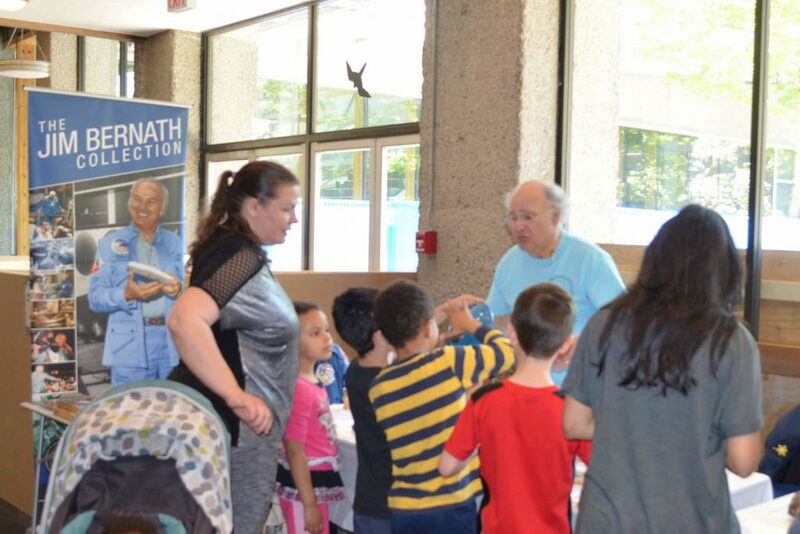 RASC activities include the Jim Bernath Meteorite Collection, several talks, Apollo rockets and mission display, solar telescope observing (weather permitting), and numerous craft and activity tables for children. Talks are in the Academic Quadrangle rooms AQ 3149/AQ 3150. More details are available from the Festival of Learning or Simon Fraser University’s event page. Free admission to all shows, activities, talks and tours. Open to participants of all ages. Three planets in the habitable zone where liquid water may be present. All the planets are in tight orbits with periods ranging from 1.5 to 19 days. The name was inspired from a type of beer brewed by monks. I didn’t realize that all seven planets in the Trappist 1 system are in resonance where their orbital periods are related by small integer ratios. For example, for every 2 orbits of the outermost planet, the next planet inward orbits 3 times. In our own solar system, Pluto and Neptune are also in a 2:3 resonance. The Trappist 1 system has a much longer resonance chain that involves all its planets. In fact it is the longest know chain of resonant exoplanets. For every 2 orbits of the outermost planet, the more inner ones complete 3, 4, 6, 9, 15, and 24 orbits respectively. Initially, it seemed like the orbits of the Trappist 1 planets would not be stable with some planets being flung out of the system, colliding, or becoming moons of other planets in less than a 1/2 million years. A Canadian astronomer, Daniel Tamayo, is the lead author on a new paper in The Astrophysical Journal Letters that explains how this system could have formed and remained stable for over 50 million years – the maximum that they could simulate on their supercomputer – by accounting for the initial conditions when the planets formed and their subsequent drift into position. Resonances are also key to music. Matt Russo is an astrophysics-colleague of Tamayo who is also a musician. He arbitrarily assigned the note C to the outermost planet and set notes for the other planets based on their relative orbital periods. You can listen to the Trappist 1 resonances in the video below. The SYSTEM Sound site also lets you make your own music using the TRAPPIST-1 planets as your instrument . Our NOVA Newsletter for Mar-Apr 2019 is available as a pdf file. An archive of older issues can be found on our Newsletter page. The Vernal or Spring Equinox occurs today, March 20 at 2:58 pm PDT: Welcome to Spring! Equinoxes occur at a time when the Earth is not titled either towards or away from the sun – yesterday (in Winter) the Northern Hemisphere was titled away from the sun and tomorrow it will be titled towards the sun (Spring). This corresponds to when the sun passes directly over Earth’s equator and crosses the celestial equator in the sky. You can use Stellarium to see that the sun is located in constellation Pisces and how it moves from south of the equator to north of the equator. The sun is south of the equator one day before the equinox. The sun crosses the equator at the equinox. The sun is north of the equator after the equinox. Crossing the celestial equator is important for determining right ascension – the celestial equivalent of longitude. The zero point for right ascension is defined to be the point where the sun crosses the celestial equator at the vernal equinox. 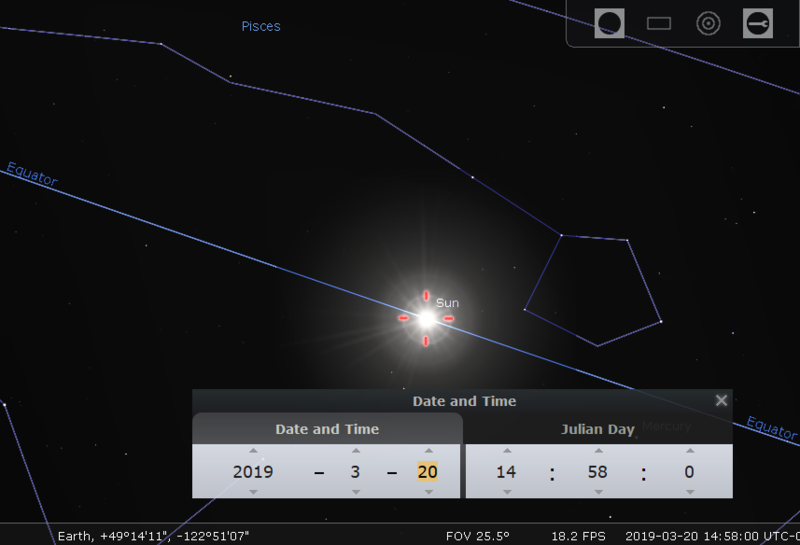 This is also known as the First Point of Aires which is a mystery because the we just saw that the sun is in Pisces. Hipparchus defined the First Point of Aries in 130 BCE when the sun was located in the constellation Aries during the spring equinox. Due to the Earth’s precession that point has been moving westward at a rate of approximately 1 degree every 72 years and is now located in Pisces – mystery solved. Bonus: There is also a full “super” moon tonight – the last supermoon of 2019 – and the forecast is for clear skies so get out and have a look. Messier Marathon 2019 – Now or Wait a Month? Charles Messier was a French astronomer who compiled and published a list of nebulae, star clusters, and galaxies, which came to be known as the Messier objects. Messier was mainly hunting for comets but sometimes ran across objects that looked like comets but were subsequently disproven. Messier’s original list identified 103 such objects that comet hunters should “ignore” – seven additional entries have been added over the years, bringing the total to 110. A Messier Marathon is an attempt to observe all 110 objects in a single night. The best time of year to attempt a Messier Marathon is often around a new Moon in March. This weekend, March 9th&10th, is just a few days past the new Moon and the forecast for the Lower Mainland is for mostly clear skies so it provides a nice opportunity. But some objects in Messier’s list will not be visible from latitudes above 40° north this weekend. Alan Whitman, a BC resident, has a “cover page” article in the April edition of Sky and Telescope magazine that suggests April 4th-5th, 2019 is the perfect night for a Messier Marathon from latitudes above 49° north. Even then, observing all 110 objects may not be possible. Planning is required for a serious attempt and the Calgary RASC Centre has some good planning tips and a great planning tool. Howard Trottier recommends a book by Don Machholz as a guide to Messier Marathons. 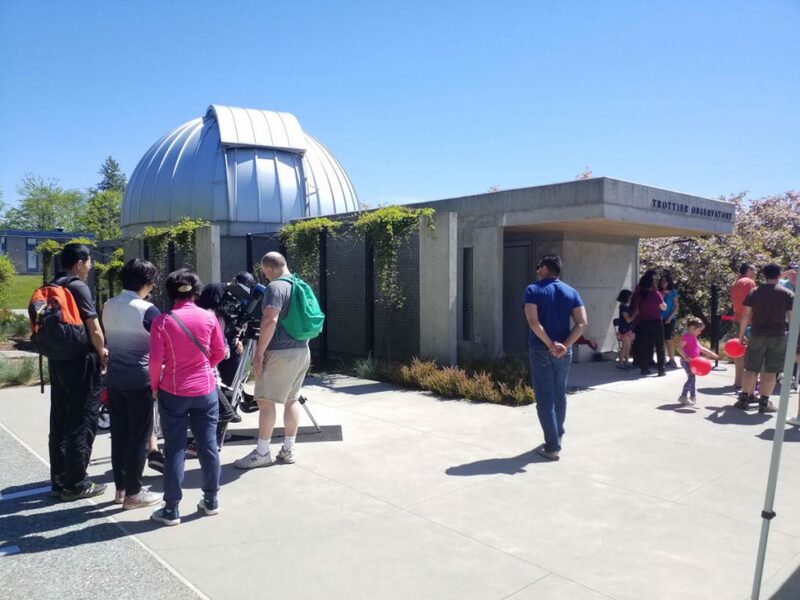 Many women have contributed to our knowledge of astronomy. Here is a short list of four women astronomers from different time periods that made significant contributions. Hypatia of Alexandria is regarded as the first woman astronomer. She lived during the late 4th, early 5th centuries. She taught mathematics, physics, and astronomy, and wrote many books about these subjects – thirteen books on algebra and another eight books on geometry. Hypatia is known to have constructed an astrolabe, an instrument used to measure the positions of the stars. She used it to calculate the positions of specific stars, and then published her data in tables in The Astronomical Canon. Sailors and astronomers used her tables for the next 1200 years. She also edited the third book of her father’s, Commentary on the Almagest of Ptolomy. 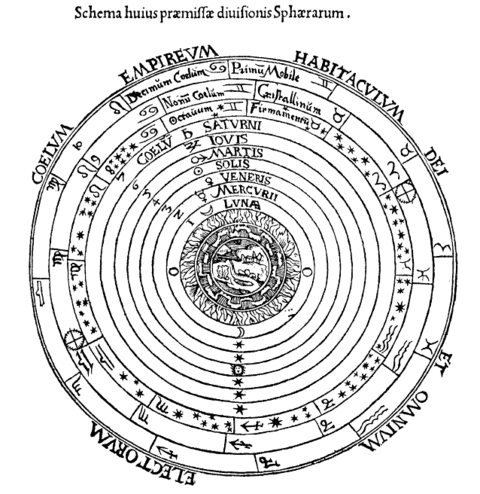 The Ptolemaic model of the universe was geocentric where the sun was thought to have revolved around the earth. In the Almagest, Ptolemy proposed a division problem for calculating the number of degrees swept out by the sun in a single day as it orbits the earth. Hypatia’s contribution is thought to be an improved method for the long division algorithms needed for such astronomical computations. Caroline Herschel was a German astronomer and the younger sister of the astronomer William Herschel. She is best known for the discovery of several comets, including the periodic comet 35P/Herschel–Rigollet, which bears her name. This image of Comet Herschel-Rigollet was obtained in August 11939. Copyright © 2010-2015 Hamburger Sternwarte, Fachbereich Physik, MIN-Fakultät, Universität Hamburg. She was the first woman to be awarded a Gold Medal of the Royal Astronomical Society and to be named an Honorary Member of the Royal Astronomical Society. The King of Prussia presented her with a Gold Medal for Science on the occasion of her 96th birthday. She independently co-discovered the galaxy M110 – this galaxy is a companion to the Andromeda galaxy M32 and was included in a sketch of M32 by Charles Messier but Messier did not include M110 in his original list. The suggestion to assign M110 a Messier number was not made until 1967. Cecilia Payne was a British-born American astrophysicist who proposed in her 1925 doctoral thesis that stars were composed primarily of hydrogen and helium. 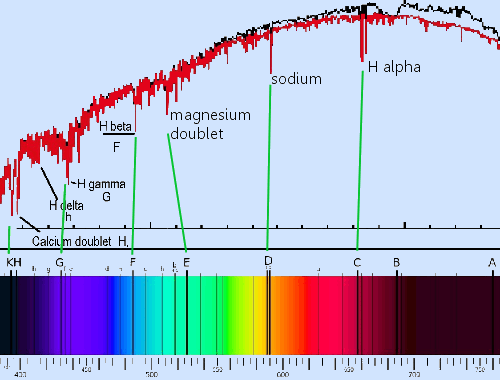 In analyzing spectral absorption lines, she found that silicon, carbon, and other common metals seen in the Sun’s spectrum were present in about the same relative amounts as on Earth, in agreement with the accepted belief of the time. However, she found that helium and hydrogen were vastly more abundant – by a factor of about one million for hydrogen. A few years later, the astronomer Otto Struve described her work as “the most brilliant PhD thesis ever written in astronomy”. Russell, himself, ultimately realized she was correct and admiringly acknowledged Payne’s earlier work and discovery; but nevertheless, he is often credited for the conclusions she reached. I believe it would demean Nobel Prizes if they were awarded to research students, except in very exceptional cases, and I do not believe this is one of them. Finally, I am not myself upset about it – after all, I am in good company, am I not! In 1967, Bell Burnell was working with Anthony Hewish, an astronomer at Cambridge who wanted to find more quasars and needed a new radio telescope to do so. Bell Burnell helped build the radio telescope and after it was built, she was left as the first person to run the telescope. During the first six months, she discovered over 100 quasars but the real breakthrough first appeared on August 6, 1967. She noted an “scruff” that she later found appeared over and over again in the same part of the sky. Higher-speed recordings made in November 1967 revealed that Bell Burnell had captured a repeating string of radio pulses spaced a bit more than a second apart that were unlike anything seen before. Temporarily dubbed “Little Green Man 1” (LGM-1) the source, which is now known as PSR B1919+21,was identified after several years as a rapidly rotating neutron star. Rotating neutron stars with regular rotational periods are called “pulsars” because the produce pulses of radio waves with a very precise intervals ranging from milliseconds to seconds. The precise periods of pulsars makes them very useful tools. They were used to indirectly confirm the existence of gravitational radiation. the first exo-planets were discovered around a pulsar, and they can rival atomic clocks in their accuracy in keeping time. 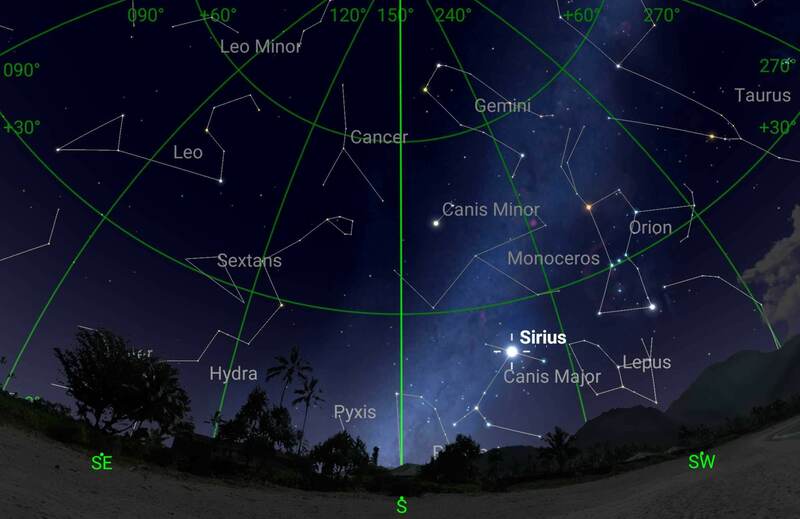 Have a look towards the south between 10 and 11pm in the next few weeks and you will see some bright stars: Castor and Pollux in Gemini are fairly high, Proycon in Canis Minor is a bit lower and Sirius is blazing closer to the horizon. To me, these “winter stars” often appear bolder and brighter than the stars in summer. But to the east of Castor and Pollux is a sparse patch of sky where Cancer the Crab, the dimmest constellation in the night sky, is positioned. The Constellation Cancer is positioned towards the South between 10 and 11 pm PST during late February and early March from Vancouver. The brightest star in Cancer beta-Canceri or Altarf, is only magnitude 3.5 so it is quite faint when viewed from a location with moderate or worse light-pollution with your naked eye. The other bright stars in Cancer are magnitude 3.9 and fainter. Nevertheless, it is worth getting out binoculars or a small telescope to observe two impressive star clusters that are hosted in Cancer. The Beehive Cluster is also knows as the Praesepe Cluster and is designated as M65 or NCG 2632. It is one of the nearest clusters to our solar system at distance of 610 light years. It appears fairly large with an apparent diameter of about 1.1 degrees. The classic Greek astronomer Plolemy described it as a “Nebulous mass in the breast of Cancer”. It was one of the first clusters observed by Galileo through his telescope and he managed to spot about 40 stars within the cluster. There are about 50 star visible with amateur equipment but over 1000 stars have being identified as being a part of the cluster with high probability. 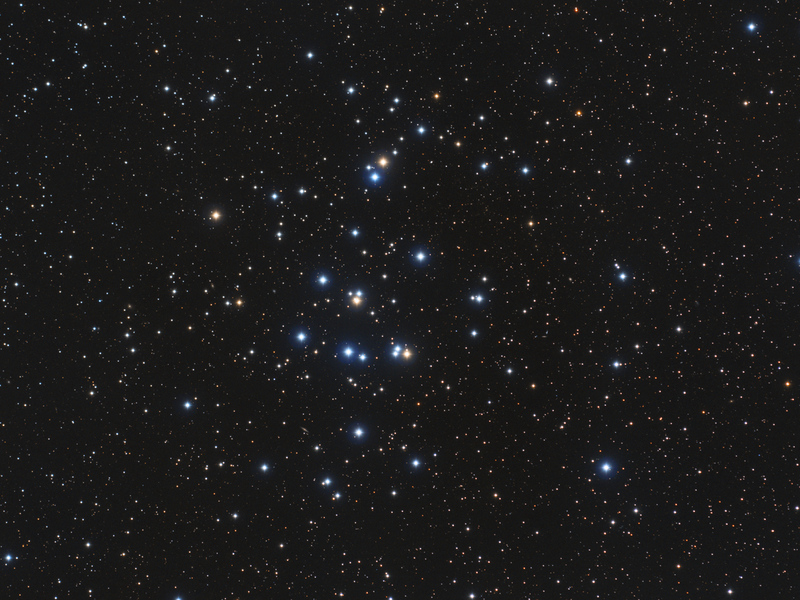 M67 is a more compact cluster. It is much older than M44 with an estimated age of 4 billion years vs 600 million years old for M44. The cluster was first discovered before 1779 by the German astronomer, Johann Gottfried Koehler, but then re-discovered a year later by Charles Messier who added it as the 67th object to his list of non-comets. If you have tried astrophotography then you will know how critical and how difficult it can be to find razor-sharp focus – stars appear as point light sources and there is no detailed surfaces to help in achieving focus. A Bahtinov Mask is a simple and widely used tool that can help. The Bahtinov Mask was invented by Russian amateur astrophotographer Pavel Bahtinov in 2005. 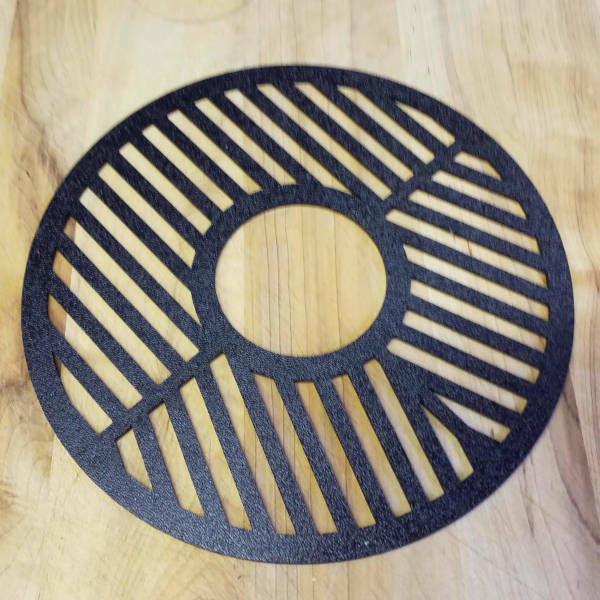 The mask is an opaque disk with slots cut out in a specific pattern. 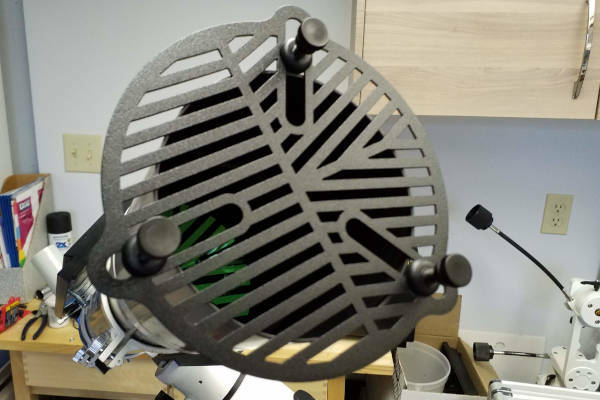 The mask is placed in front of the telescope’s objective lens or mirror so that three diffraction spikes appear when the telescope is pointed at a bright star. The central spike moves in relation to the other two spikes as the focus is changed. Focus is achieved when the central spike is perfectly centered between the other two spikes. 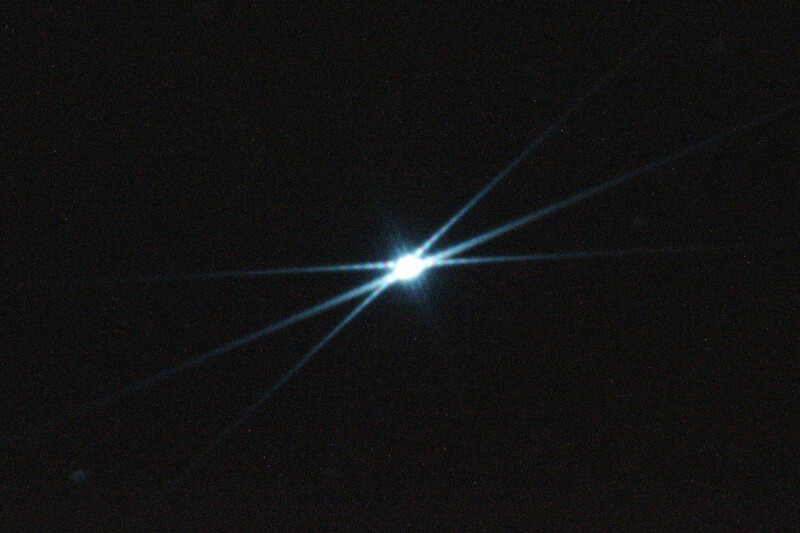 The image above show how the bright star Menkalinan in Auriga appeared when imaged using a Bahtinov mask on a Celestron EdgeHD 8 with a Nikon D5100 DSLR. A Bahtinov mask should be the proper size to fit your telescope. I have two masks: one that fits over the dew shield of a ED100 refractor and another that fits over the corrector plate of a Celestron EdgeHD 8. Bahtinov masks can be bought commercially or you can make one yourself – the deep-sky watch website has printable PDF plans for many common telescopes. The lectures are free and will be held in the Green College Coach House on the UBC Point Grey campus from 7:30pm- 8:30pm. Receptions will follow each lecture. Lecture 1: The Arctic cannot fully be understood without including Outer Space, from low Earth orbit to distant stars. It is time for a paradigm shift in our view of the Arctic, so that we see it anew in 3D: centred on the North Pole but extending, thousands of kilometres across the top of the planet, several kilometres down into the Arctic Ocean, 35,000 kilometres up to geostationary orbit, and billions of kilometres beyond that to other galaxies and stars. In the first of his McLean Lectures in Canadian Studies, Michael Byers explains our 3D Arctic in terms of its geographical, cultural, technological, political and legal connections to Outer Space, and points out the implications these have for the disciplines of international relations, international law and political geography. Lecture 2: Donald Trump announced the creation of a Space Force last summer. The US President assumes that Space will become a “war fighting domain,” and there is at least some support for his assumption. For instance, in 2007, China tested its ability to destroy operational satellites by targeting a derelict satellite with a ground-based missile, creating more than 35,000 pieces of debris larger than one centimetre, all of which pose severe threats to other satellites and spacecraft. Yet since then all countries, including China, have refrained from testing anti-satellite weapons in ways that could create more debris. There is, in fact, a remarkable amount of cooperation in Space, with the International Space Station being just the most prominent example. There is also a great deal of cooperation in the Arctic, with Russia and Western states working closely together on search and rescue, fisheries management, and scientific research. This lecture explores the reasons for such cooperation, pointing out that the Arctic and Space are both remote regions with extreme environments, both suffer from “tragedies of the commons,” and both are militarized but not substantially weaponized.